It seems like the minute Lily was born she was either reaching for my cell phone or my tablet. At just 3 years old she has learned how to press every single button, change every setting, find the most inappropriate things and test the limits of my warrantee. It frustrates the heck out of me, but how can I deny that cute little face some electronic entertainment. I have spent more money than I will ever admit to, trying to find a tablet that’s just right. I’ve purchased several a couple of different “kid” tablets, which she lost interest in rather quickly. As well as one or two “regular” tablets, that she has either broke or figured out how to get around the parental controls. However this year I’ve nailed it with the Amazon Fire HD Kids Edition Tablet. It’s a full-fledged tablet designed for kids. It does everything that you expect from a tablet with the addition of some fantastic safeguards. Each member of your family can use it by setting up their own profile. 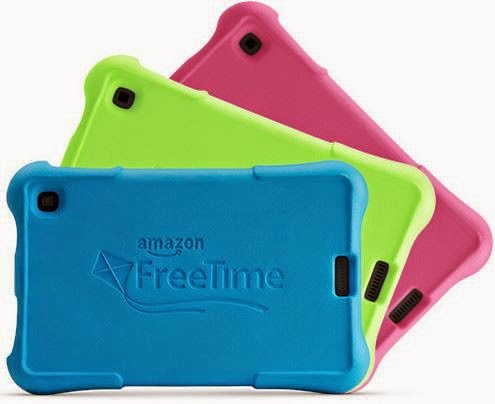 It comes with a durable, lightweight kid proof case that protects the tablet from clumsy mishaps. As well as a 2-year Worry-Free Guarantee. First ever, 2-year Worry-Free guarantee. Your tablet will be replaced if anything happens to it, no questions asked. The Amazon Fire HD Kids Edition Tablet has absolutely answered every single one of my concerns and then some. I was a little skeptical when I first started researching it, I’d been burned before, but Amazon knocked this one out of the park. When I first pulled the tablet out of the box I couldn’t help but notice that it looked exactly like my Amazon Fire, the one that Lily loves to play with. The only noticeable difference was that this one came with a colorful kid proof case. It wasn’t until I turned it on and started playing around with it that I realized what made this tablet so special. It had everything that I expected in a tablet for a 3 year old; durability, appropriate content, fantastic safeguards, educational, entertaining, outstanding quality, affordablity. The real test was if it had everything that Lily expected in a tablet. As soon as I got Lily’s profile set up (which was super easy to do) she was off and running to her special spot with her blankie and the tablet in hand. I followed close behind so that I could show her how to use it, but this very independent little girl wanted no part of it, she was going to do it herself. So I let her be and slyly watched over her shoulder to see what she was up to and ready to offer my help if she needed it. Fortunately or unfortunately, I guess it depends on how you look at it, she never needed my help. She jumped in and figured out how to read books, play games and watch some of her favorite videos from Disney, Nick Jr. and more. After two hours of Lily exploring and playing, the tablet turned itself off. She was a little upset by this because she was having so much fun. However I was thrilled, the time limits I set made sure that she wasn’t spending more time than she should on the tablet. Of course, for the next hour or so she begged me to play with the pink again, that’s what she calls it. I told her that if she ate her lunch and took a nap like a good girl I’d let her play with it again, I didn’t realize that it would also be such a great bribing tool too! I couldn’t have designed a better tablet myself. This tablet has satisfied all of my concerns and Lily is completely fascinated with it, I don’t see her losing interest in it anytime soon. 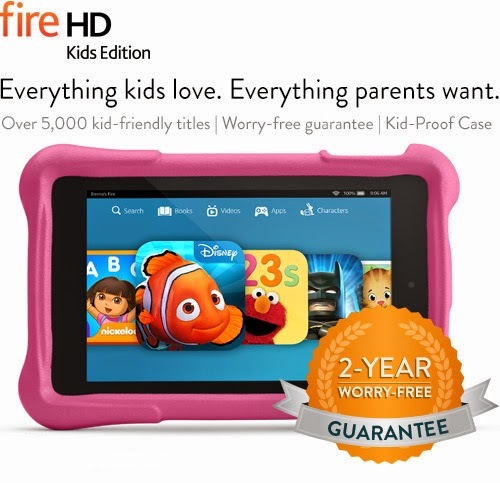 If you want to see for yourself how amazing this tablet is check out the Amazon Fire HD Kids Edition Video Tour.